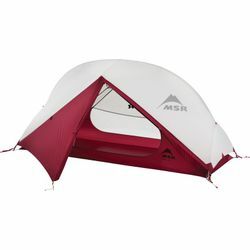 MSR Hubba NX Solo Backpacking Tent. New for 2019. The Hubba NX solo backpacking tent offers the most livable accommodations in a lightweight freestanding design. Engineered for 3-season camping, the light and compact tent won’t slow you down, whether you’re striking out early to earn solo views along a popular route, or finding your stride on a 10-day trek into the Alaskan wilderness. The tent’s spacious interior maximizes comfort, while new premium Easton® Syclone™ Poles and our long-lasting Xtreme Shield™ waterproof coating enhance the durability of this high-performance shelter. Together with its StayDry™ door and adaptable, cross-ventilating rainfly, the Hubba NX is so livable, you won’t want to come home. Ultralight: Minimum weight is 1.12 kg / 2 lb 7 oz; optional Fast & Light Body setup .93 kg / 2 lb. 1 oz. Livable: Large StayDry™ door with built-in rain gutter; adaptable, cross-ventilating rainfly.